How do you turn 10 sentences into a $100 dollar movie? Maverick moviemaker and Hollywood’s original Wild Thing Spike Jonze has spent five years mud-wrestling with his adaptation of Maurice Sendak’s ‘60s kiddie-lit classic . But Jonze’s big-screen rumpus might take even longer to grow on you. We start in the frosty pain of the oh-so-real world, where lonely boy Max (Max Records) lives with his divorced mother (Catherine Keener). When Mom brings home a boyfriend (Mark Ruffalo), mad Max pulls on a wolf suit, bites her harder that he should have, runs away into the night, climbs into a tiny sailboat and arrives at a strange faraway island. Here he discovers a group of super furry animals arguing with each other and destroying stuff. This is his childhood heart of darkness – and he declares himself King. Brought to life with a brilliant combination of nine-foot costumes, puppeteer actors, CG faces and star vocals (James Gandolfini, Forest Whitaker, Catharine O’Hara), these six giant beasts are the little voices in Max’s head. They’re all monsters of the soul, howling out the raw emotions (sadness, joy, frustration, fury, envy, angst) that a nine-year-old boy can’t express himself. And so the wild rumpus begins… Or does it? Like an incredible episode of Jonze’s MTV smash-‘em-up skate-show Jackass , Max and the Wild Things hurl themselves into dirt-clod fights, then build a fortress, then smash it down. But mostly, they sit around with sad-sack expressions on their faces talking about their feelings. If that sounds more like a group therapy session, you’d be right. To pad out the book’s blanks, Jonze and his co-scripter, wunderkind orphan author Dave Eggers , have turned the Wild Things into dysfunctional grown-ups built from their own childhood memories. 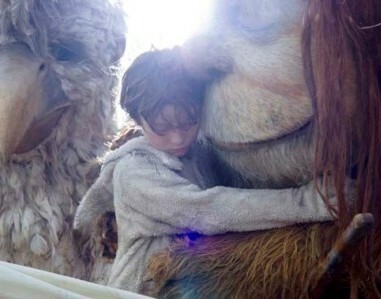 Meaning Where The Wild Things Are isn’t really a children’s movie – it’s an adult’s movie about childhood. Caught in the churning sea between these two worlds, it feels too long, too lost and too hard to fall in love with. You do have to love Jonze’s untamed, exuberant ambition – there’s real beauty and terror in his gorgeously lensed world of dark forest, glittering ocean and rich desert, where free feelings can explode dangerously and little boys might be eaten by their friends at any second. But there’s a big empty space in middle of the movie – like the trees with mysterious holes in their trunks – and Jonze can’t find enough poignant truths about families, happiness and childhood to fill it with. Too dark for children, too lightweight for adults. Can’t help wondering if this is a truly great 30-minute film stretched across two hours. Very good text. I’ve found your blog via Yahoo and I’m really glad about the information you provide in your posts. Btw your blogs layout is really messed up on the Kmelon browser. Would be cool if you could fix that. Anyhow keep up the great work!